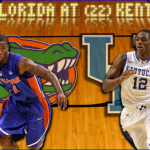 » Kentucky leads the all-time series against Florida 89-33; the Wildcats swept the Gators last season, but the team’s split their regular season contests in 2011. 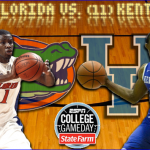 Florida is 9-5 in their last 14 games against Kentucky and Donovan is 13-19 against them all-time. » Calipari is 3-1 against Donovan as the Wildcats’ head coach. 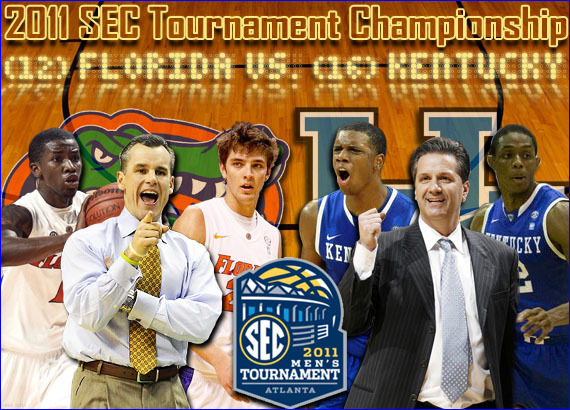 » UF and UK have combined to win six of the past eight conference tournament titles. It is only the fourth time both are meeting in the title game, with Kentucky holding a 2-1 advantage in such match-ups. » Since 2004, Florida has won the most SEC Tournament titles (three – 2005-07) and games (15) in the league. Among the six major conferences, UF ranks only behind Duke and Kansas since 2004 in conference tournament titles and league tournament wins. » The Gators are 12-2 in their last six trips to the Georgia Dome (18-7 since 1992). They have won two SEC Tournaments (2005, 2007) and a NCAA title (2007) in the stadium. They have also won their last three SEC Tournament final appearances (2005-07). » Florida has won 18 of their last 21 games (and 10 of their last 11) with 16 victories against RPI top 100 teams. 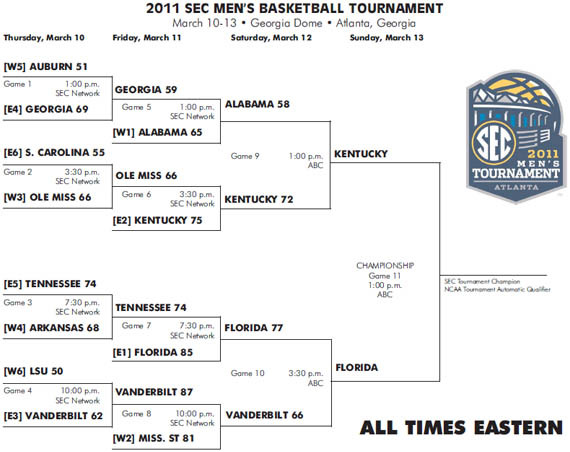 » UF enters the game having won the 2011 SEC regular season title and as a No. 1-seed in the tournament. UK is a No. 2-seed. » The current Gators team is the fourth in school history to win 24+ regular season games. They also captured the third outright SEC title in school history (1989, 2007) and are the fifth team in school history to reach 26 wins in a season. » Florida is 21-1 (10-0 vs. SEC) when holding an opponent under 70 points this year. » The Gators, struggling all season from the line, are hitting 72.3 percent of their attempts from the charity stripe over the last 10 games. » Florida is 10-2 when senior forward Chandler Parsons takes 10+ shots from the field. He has moved into the top 20 in school history in scoring (1,393 points) and is one of only two active players in Division I college basketball with over 1,300 points, 800 rebounds, 300 assists and 100 steals. He also became the sixth player in school history with 500+ career field goals after hitting four on Friday. » Gators junior point guard Erving Walker, hitting a trio of three-pointers on Friday, moved into the top five all time in school history. » UF has reached 20+ wins for the 13th consecutive season, the longest active streak in the SEC. The Gators have also reached 10 wins in league play for the ninth time in the last 13 years and first time since 2007 (13-3). » Florida’s +6.2 rebound margin is the best in the SEC. » The Gators have been averaging 50.2 points in the second half over the last four games, while shooting 61.2 percent from the field and 54.3 percent from downtown. Florida has averaged 81.5 total points over the last for games. 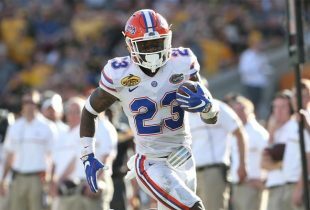 In three of those contests, UF scored 49, 56 and 48 points, respectively, in second halves; they outscored opponents by 18.6 points in the second half in those games. » UF is 7-1 in the SEC this year with three or fewer days to prepare for a game. » Kentucky bests Florida in two of four major statistical categories including points per game 76.8-71.9 (23rd-87th) and rebounds per game 38.5-37.4 (23rd-58th). However, the Gators hold the advantage in and field goal percentage .463-.460 (47th-62nd) and assists per game 13.8-12.6 (102nd-181st). Florida also holds their opponents to fewer points per game 62.8-64.2, forces more turnovers 12.8-12.3 and grabs more steals 6.0-5.5. UF ranks 7th in RPI (.6395) and fifth in strength of schedule nationally compared to UK being ninth (.6383) and ninth, respectively. Florida and Kentucky will square off for the third time this season; the Gators defeated the Wildcats 70-68 in a thriller in Gainesville, FL on Feb. 6, but the Wildcats countered with a significant 76-68 victory in Lexington, KY on Feb. 26. In the first game, Florida fought off a late surge by Kentucky after being up a game-high 13 points with 11:50 remaining. The Gators out-scored the Wildcats 5-2 in the final two minutes of the game to hang on for the win. UK got a measure of revenge in the second game by piling it on UF late in the second half for the decisive victory. » Parsons…the 2011 SEC Player of the Year and a unanimous All-SEC First Team selection…who is averaging double-digit points (11.6) while leading the Gators with 7.8 rebounds and 3.6 assists per game. Parsons ranks No. 1 among active SEC players in rebounds (821), No. 3 in points (1,405) and assists (314) and No. 4 steals (125). At one point he notched three-straight double-doubles and now has seven this year. » Walker…who was marred in a shooting slump but has rebounded and is still leading his team in scoring with 14.6 points per game while also leading the backcourt in both field goal percentage (.415) and three-point percentage (.379). Walker also tops Florida’s turnover rankings (78) and became the 47th player in school history to score 1,000 points earlier this season. » Sophomore guard Kenny Boynton…who is arguably the Gators’ most talented player but was struggling with consistency shooting the ball. Boynton is hitting 38.2 percent from the field and 33.3 percent from beyond the arc; however, he is second in scoring with 14.3 points per game and makes a team-high 81.7 percent of his free throws. He is also shooting 89.0 percent from the line (73-of-82) in SEC play. Boynton has been stellar from the floor over the last three games, hitting 48.3 percent of his field goals (29-of-60). » Redshirt senior center Vernon Macklin…who is shooting a team-best 57.3 percent from the floor as a starter this season with most of his buckets coming inside the paint. He averages 11.5 points and 5.7 rebounds a game while being a major presence for UF. » Senior F Alex Tyus…who is averaging career-lows in points, rebounds and field goal percentage as a starter. Tyus became just the fifth player under Donovan to reach 500 career field goals, accomplishing the feat two weeks ago against Vanderbilt. » Freshmen PG Scottie Wilbekin and C Patric Young…who are Florida’s primary reserves each averaging over 17 minutes per game. Wilbekin, in relief of Walker, leads UF in assist-to-turnover ratio (2.32:1), while Young averages 3.3 points and 3.6 boards. » Kentucky G Brandon Knight…who plays a team-high 35.8 minutes as a freshman, averages 17.5 points per game and picks up nearly four rebounds and assists per contest, too. Knight and Boynton are friends who grew up and played both against each other and together in South Florida. » Wildcats F Terrence Jones…who leads his team in rebounding with 9.0 boards per game and nearly matches Knight in points with 16.5 each contest. 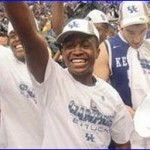 » Kentucky G Doron Lamb…who has been on fire for his team since SEC Tournament play began. Lamb is averaging 13.2 points on the season but has combined to score 34 over the last two games. Start of the second half and we look tired. 12 points down and growing as I type. I wonder if UK pays the refs as much as their players. Reversing a call for the coach and then T-ing up a player for walking away from the ref is complete BS, especially when they blow the call. I guarantee Slive will say something, and we’ll never hear about it. We didn’t play our best game, but it looked like there was a deliberate effort to not call fouls underneath to keep a shallow Kentucky team in the game. It is a little re-assuring that if history repeats itself, this loss will probably be eliminated from the history books. You can’t blame the kids for realizing partway through the second half that they would not get any type of even calls, BUT, we just did not get physical enough on either end of the court. If you’re not getting the calls you can’t be physical, it just gives them more opportunities. It reminds me a lot of the OSU championship game where Odum could pull a knife and the refs would still look the other way. That being said Macklin had a poor game and we could not find the handle the entire afternoon. The more aggressive team in terms of attacking the basket got the foul calls, and the tougher team won, period.